Multifamily apartment owners and property managers have unleashed a wave of remodeling activity over the past year, according to Fran Rainey, who owners the Kitchen Solvers in Rochester, MN. It appears landlords are upgrading their properties to compete against a surge of new complexes. In the process, they’re discovering that kitchen cabinet resurfacing can provide a needed update without the price tag of new cabinets — an attractive option for rental property owners. Rainey recently remodeled the kitchens in a 19-unit apartment building in nearby Lanesboro. 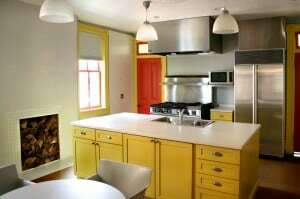 Rather than gut the kitchens, he repaired the existing cabinets and installed new drawers, cabinet doors and hardware. The process took two days. The kitchens look brand new, while the owner saved thousands per unit, and residents were able to stay in their homes during the two-day process. Rainey, who has mostly worked in houses during his 13 years with Kitchen Solvers, is now eyeing thousands of other rental units in area. The company, which has 68 franchise locations throughout the United States and Canada, expects to grow in 2013 to meet rising demand for remodeling. The National Association of Home Builders’ Remodeling Market Index, which tracks market conditions, is at its highest level since 2005, and NAHB chief economist David Crowe says it’s more evidence that remodeling has rebounded from the recession. Kitchen Solvers is a 30-year-old kitchen remodeling franchise that specializes in kitchen cabinet refacing — a thrifty alternative that makes a beautiful kitchen more affordable. To learn more, visit www.KitchenSolvers.com.